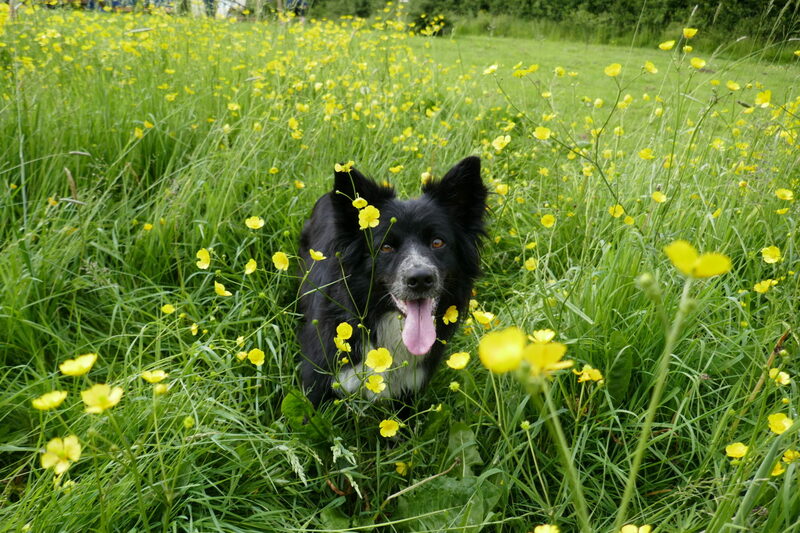 Dog friendly holidays with us! Having 6 dogs of our own we know how important they are to you, and we know they’d like a dog holiday too! 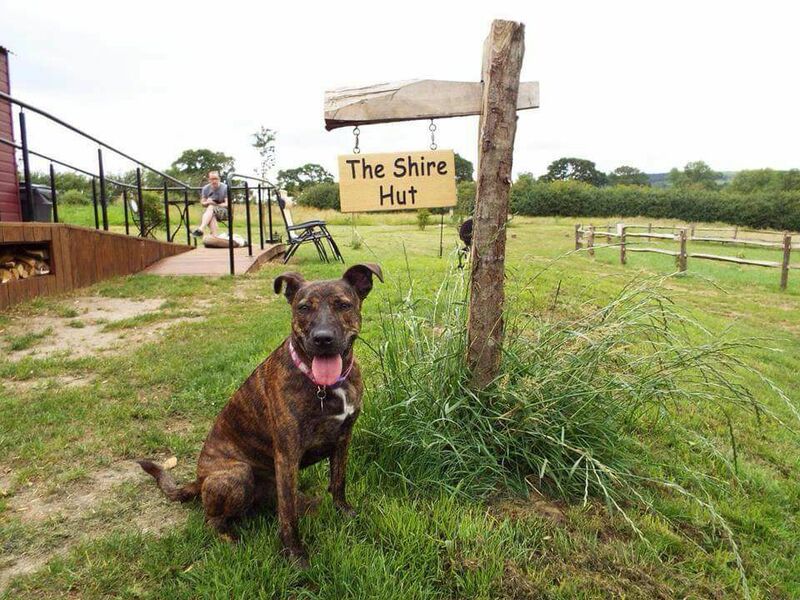 So here at the Shepherd’s Hideaway we allow you to bring your dog on holiday with you, at no extra charge. Whilst we welcome your dog on holiday we ask that you do not leave them unattended in the huts. If you’d like to leave your dog with us whilst you go out during you holiday then we have a heated kennel and large run provided free of charge. 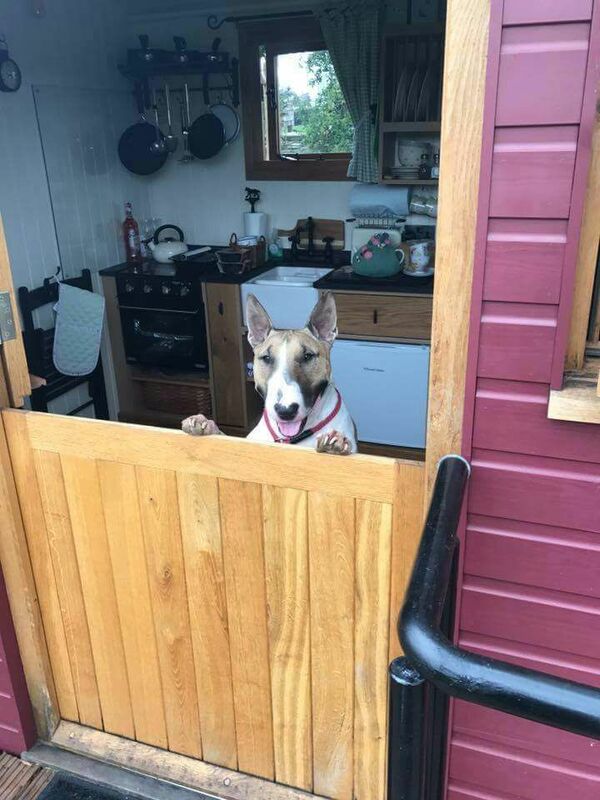 If you know your dog would not be happy in our heated kennel, we can look after your dog in our home. This service is limited however, so please contact me for availability. If you require this service then we charge £10.00 per day, with same charge for evenings. 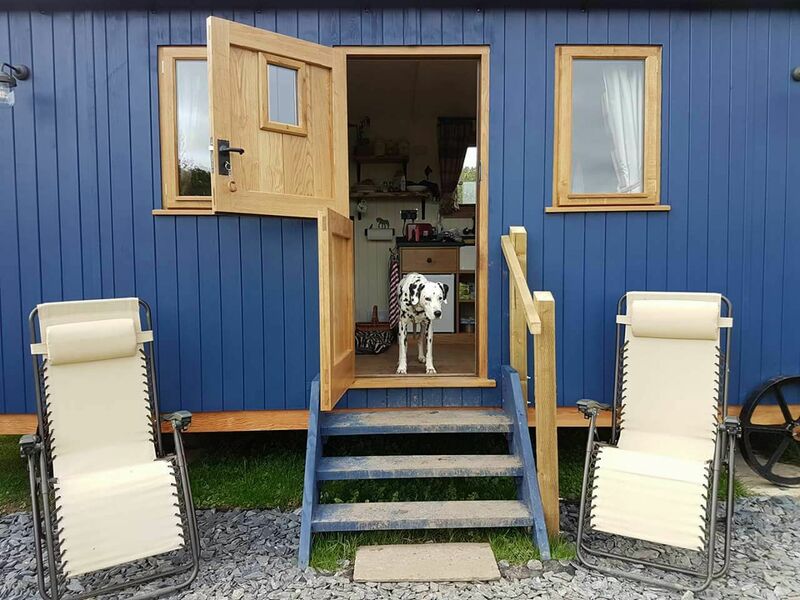 Your hut is set in approximately an acre of ground, which is divided into an orchard/ meadow, a small paddock, a fenced off area for our rare breed sheep (grey faced dartmoors), duck pond, chickens pygmy goats. 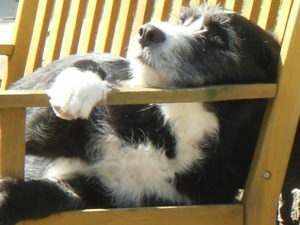 Here’s Billy (our Irish Wolfhound x Collie) relaxing in the sun on his bench! Can my dog run free on his dog holiday? 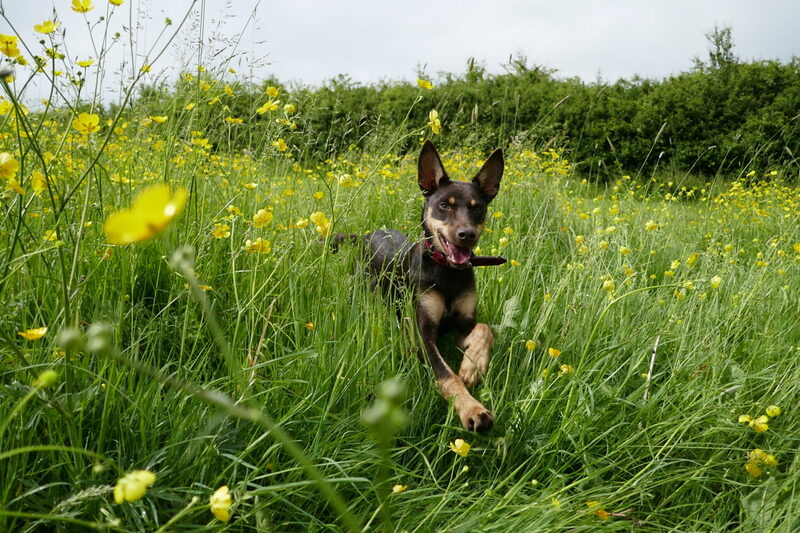 Running free is permitted, the area is totally enclosed by stock net fencing and 5 bar gates, so providing you dog isn’t small enough to go through the whole or agile and able to jump stock fencing and you ensure the gates are closed he/she can have the run of the park. 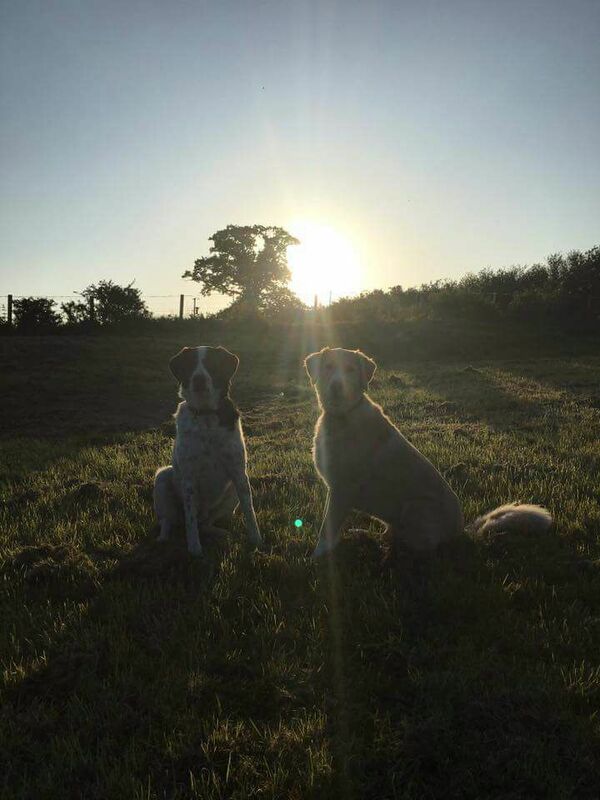 Please be aware however that there may be holes in the hedge rows that a dog could sneak though, therefore we advise that if your dog does not have a good recall you should keep them on a lead at all times as we are surround by fields holding livestock. After a good run round he/she can lounge in the decking/ramp or curl up on those colder days in front of the log burner. What your dog will need to bring? Tell your dog to bring their own dog bed/blankets and feed bowl (a no spill water bowl is provided in the hut)! We also suggest you bring along some old towels just to rub them down and wipe their paws if required before entering your hut. Please don’t leave your dog alone! Fancy a night out with your dog? Our nearest dog friendly pub is the Blue Lion, Cwm just 4 miles away. Were you and your dog are welcome to sit in front of the fire. No dog holiday would be complete without a bracing walk on the beach! All along the north wales cost you’ll find miles of sandy beaches to walk your dogs, and many off cafes provide water bowls for quench your dog’s thirst. St Asaph is the second smallest cities in the UK, the beautiful river Elwy is a great place to walk you dog. The riverside walk in St Asaph has a number of carved statues of wildlife which resides along the river bank. We do ask that you pick up your dog mess and poop bags are provided along with a designate bin for both your convenience and ours. 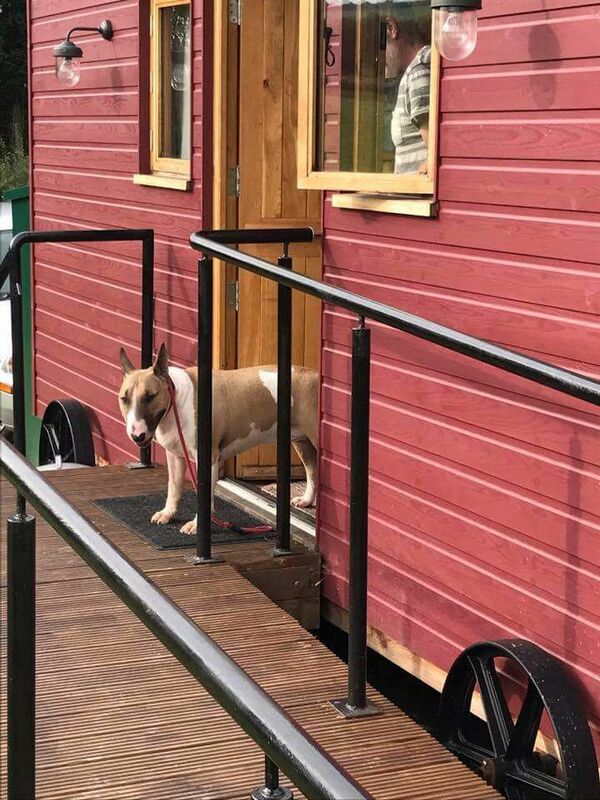 Is my dog too large to stay in the shepherds hut? 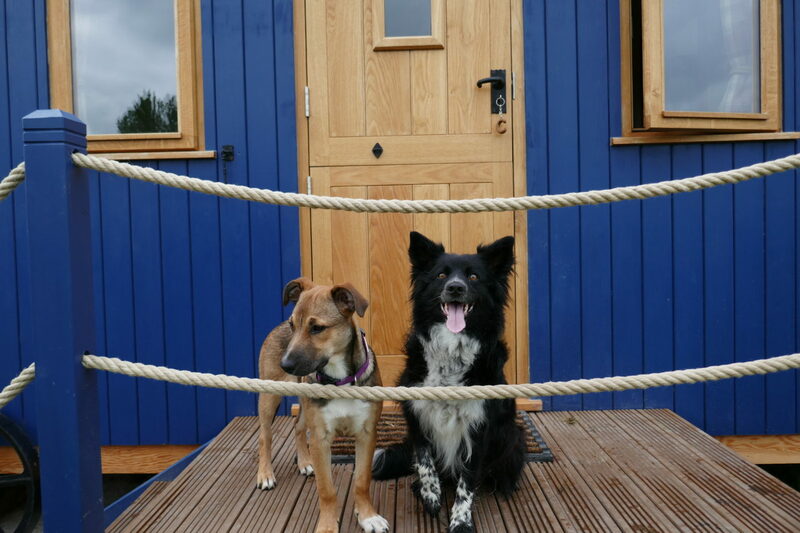 Please bear in mind that whilst the shepherds hut is one the largest on the market the space inside them is still limited, so would not accommodate extra-large dog breeds.